Well, I never got around to writing a preview but if I had I would have told about how this was going to be my 6th time running it. I hadn't planned on running the first one in 2006 but Karla was real excited about doing it and after she found out she had cancer and was still planning to run it I decided to be there to share it with her. We got through that one slowly but had a lot of fun and then I returned to run it with her a year later after completion of her therapy. I returned again in 2009 and 2010 attempting to race it hard but blew up both years. Skipped 2011 and returned in 2012 just planning to run with Karla again and this time we had Amy along with us going for a pr. Amy did pull ahead around mile 20 and got that pr. I stayed with Karla until mile 22 and blew up again. Just can't run well on this course ! Which brings us to 2013. The only reason I signed up was because I was wanting to run another marathon with Karla which we haven't had a chance to do since last year. Karla has been running very well and I was hoping she would be going for a pr and share the run. So, on Friday I drove down to the OBX and was once again a guest of the Howell's for the 4th time since I began training with Lisa. 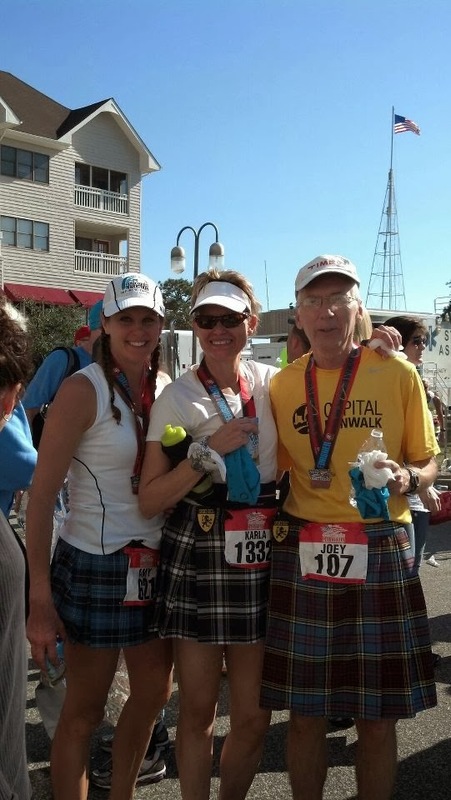 Lisa had been having some issues with her training this year and opted out of racing it but would be volunteering. Amy had decided to use this race as a last shot at qualifying for Boston this year so she was along for the run also. Spent Saturday just chillin and saving energy for the Sunday am race. Drove to the shuttle with Amy and along the way we were talking about the race. She was nervous about whether she could get the PR and BQ. I confided with her that I was actually nervous a bit too. I have done so many races that I usually don't but with my recent hamstring issues I was having doubts that I would be able to stay up with Karla and I really wanted so bad to be able too. So as the gun went off we headed out and luckily we didn't have to do too much weaving around other folks to find room to run. She needed to average 8:23 and we hit mile one in 8:30. Counting the slow first 1/4 I told er we were probably right on pace now heading to mile two. The effort felt a little hard but I was ok and the good thing was I was not feeling any pain. We hit mile two in 8:15 and then I wished her well and sent her on her way. Then I just stopped running and walked backwards looking for Karla. I figured she was probably just about 2 minutes or so behind me and sure enough in no time there she was. I fell in beside her and it felt good to be running a bit slower. I told her I was really glad I didn't have to try and run Amy's pace today. We hit mile 3 in 27:45 and with her goal of 9 minute pace with the 1st slower mile I thought we were close to what we needed. Sure enough we were right at 9 to 9:05 pace from that point on for awhile. It was a perfect day temperature wise for the race but already we were running into about a 15 mph wind and it was going to be in our face or side for just about the whole race. We were having our usual great time together but I could already tell by mile 9 that I was probably not going to have a good day. By the time we entered Nags Head Woods and the dirt road and hills we were already slowing down and commented that at the effort we were putting out it sure seemed like we should be going faster. We came out at the halfway point in about 2:03 and the goal of a sub 4 for her was pretty much out the window. We tried to pick the pace back up but it just wasn't happening. For me at least it was obvious that the lack of training from the injury along with the slow recovery from my 50 miler just 3 weeks before had me worn down. By mile 14 I was struggling to keep up with Karla and by 15 I should have let her go but I wanted so much to be able to run with her that I hung on and just hoped that I would perk up again and at least be able to run with her. Finally at mile 16 I just couldn't hold the pace so I told her I had to let her go. I walked for a minute to let my heart rate go down some and then began to run at a slower pace. I was pretty bummed and not really looking forward to the last 10 miles now. I was able to to at least hold a decent shuffle for the next 5 miles but then with 5 to go the wheels had come completely off and it turned into a death march. I was just so beaten down and wanted it to just be over. I was finding it hard to comprehend how I ran the last 10 of the 50 miler faster than I was shuffling these last 10 here. As I was close to the 3:40 mark my thoughts were with Amy and hoping so much that she would have been able to pull off the long shot and finally get her BQ. And I was hoping Karla was still maintaining a good pace. Those last few miles were some of the most miserable I have spent in a marathon and I was so relieved to finally see the finish. All day despite the suffering I was encouraged along the way with dozens and dozens of cheers for my kilt and quite a few as I was entering the chute. I tried to be happy and acknowledge the crowd but as I crossed the line I was so worn down I was holding back tears but then when Karla saw me and came over I just started boohooing all over her. We went to look for Amy and Frank and soon found them both and went to get some food. Amy had missed her BQ but had at least gotten a course pr and with all she has been through I am so proud to see how far she has progressed this year. I had started a tradition recently at Wineglass after Rebecca made a joke of doing pushups after my races and had done so after the 50 also. 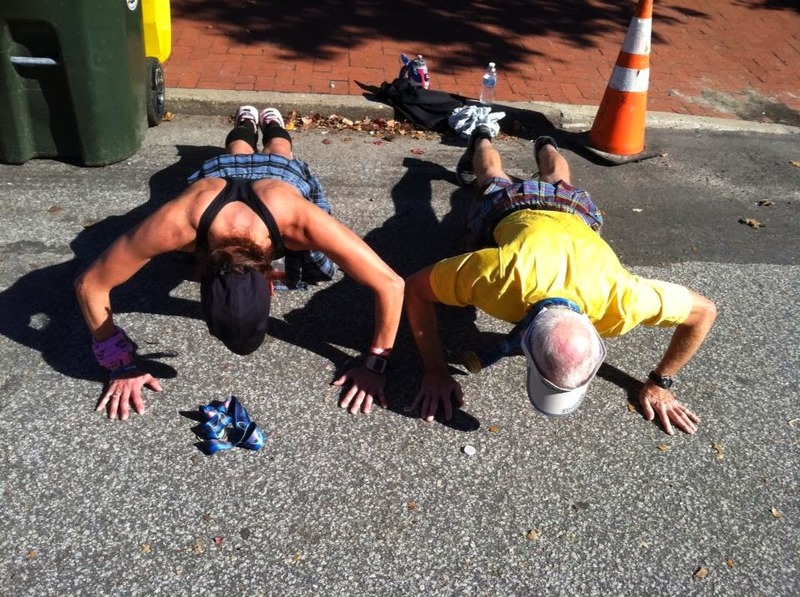 I wasn't even thinking of it when Amy commented that we should do some so we found someone to take pictures and dropped in the street to do 26.2. Then we found Dave and Olga and headed over to the deck of the Tranquil house Inn to chill out for awhile on a beautiful afternoon. We rested up for awhile and then it was time to say good bye and head to the shuttles and begin the trip home but before we left it was time for one more little tradition. 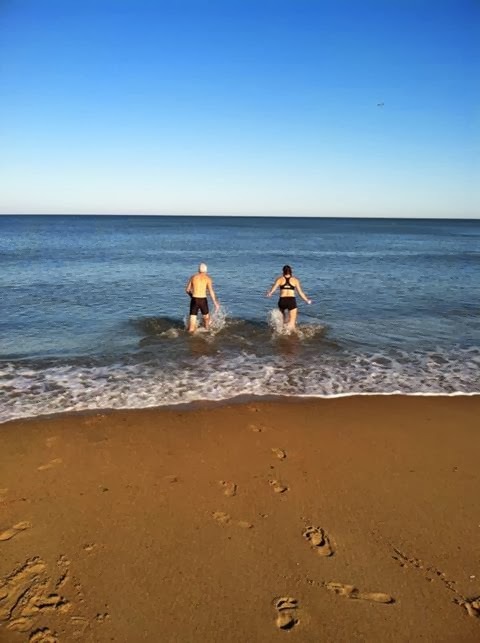 Amy began adding a "polar plunge" whenever possible after an event and I had joined her at Myrtle Beach last February so after we got back to our cars we drove over to the beach. 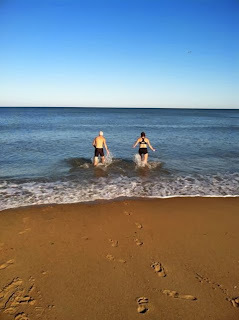 The air temperature was nice but the water was still cold enough to take our breath away ! Good times ! Next adventure will be a return to Derby for my 10th finish there. Stay tuned. Sorry it wasn't a good race for you! But you were with some awesome friends!! Honestly . . . doesn't get any better than that! No matter your time!! you got that right Frank. Nothing better than spending a weekend with some of my Angels. Oh, and Mr Werner too.